• The combination is azidothymidine (AZT), a new class antibacterial, and low dose colistin. • The combination is active against all three WHO Critical Priority Pathogens. • AZT and colistin act synergistically against carbapenem and colistin-resistant Enterobacteriaceae (CRE) infections. Helperby Therapeutics announces trial results for unique combination antibiotic therapy at ECCMID. MADRID--(BUSINESS WIRE)--Helperby Therapeutics Ltd (Helperby) has presented data at the European Congress of Clinical Microbiology and Infectious Diseases (ECCMID) announcing Phase I results on the tolerability, pharmacokinetics, pharmacodynamics and efficacy of AZT and colistin both alone and as a combined therapy, against multi-drug resistant Enterobacteriaceae (CRE), one of the most serious drug resistant pathogens. Helperby also presented preclinical data which shows that AZT is active against carbapenem and colistin resistant Enterobacteriaceae. AZT is a DNA chain terminator and represents a new class of antibacterial agent against the most resistant Gram-negative bacteria. Further data were presented showing the combination to be active in animal models. This research paves the way for further clinical trials and the potential for the development of a new class of antibiotics, effective against some of the most resistant pathogens. This combination could reach the market in just three to five years. The significance of these data is that the WHO Critical Priority Gram-negative Carbapenem Resistant bacterial pathogens will contribute to the 10 million deaths which are predicted worldwide by 2050 from treatment-resistant infectionsi. The increasing resistance of pathogens to antibiotics is a serious threat to modern medicine. Blood-stream infections with these highly resistant bacteria can result in fatality rates of over 50%ii. The combination provides antibiotic enhancement with a low dose of colistin, which is safe and tolerable in humans as demonstrated by the phase 1 results, and so avoids the risk of renal toxicity associated with colistin in higher doses. Helperby’s new class of ARB antibiotic therapy is one of only a handful of drug candidates that the World Health Organisationiii has identified as in development to tackle the three WHO Critical Priority pathogens; Carbapenem-resistant Enterobacteriaceae (CRE), carbapenem-resistant Acinetobacter (CRAB) and carbapenem-resistant pseudomonas aeruginosa(CRPA). AZT and colistin are known entities and their mode of action, side-effects and interactions are well known by regulatory authorities. 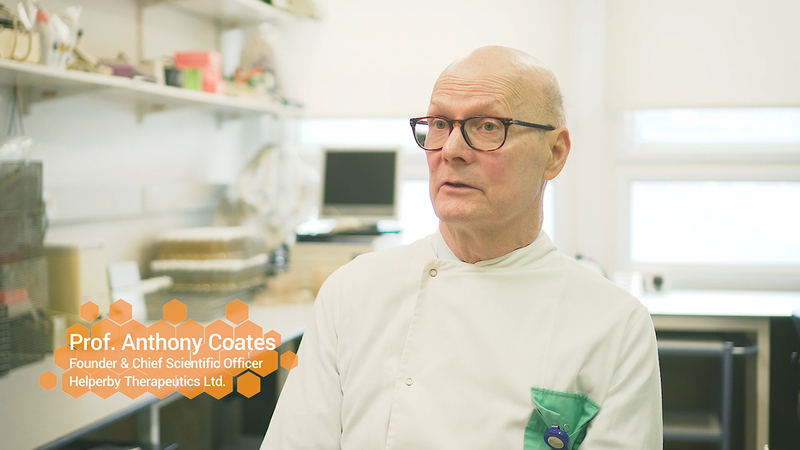 “Our unique approach of combining antimicrobial resistance breakers such as azidothymidine with existing antibiotics has the potential to reach the market with a new class of effective antibiotic therapy in 3 to 5 years”, said Professor Coates, founder and Chief Scientific Officer at Helperby Therapeutics. i de Kraker, M. E., Stewardson, A. J., & Harbarth, S. (2016). Will 10 million people die a year due to antimicrobial resistance by 2050?. PLoS medicine, 13(11), e1002184. ii Sexton, M. E., Bower, C., Sukumaran, S., & Jacob, J. T. (2017, October). Comparison of 30-and 90-Day Mortality Rates in Patients with Cultures Positive for Carbapenem-resistant Enterobacteriaceae and Acinetobacter in Atlanta, 2011–2015. In Open forum infectious diseases (Vol. 4, No. suppl_1, pp. S44-S44). US: Oxford University Press. iii Antibacterial agents in clinical development: an analysis of the antibacterial clinical development pipeline, including tuberculosis. Geneva: World Health Organization; 2017 (WHO/EMP/IAU/2017.11). Licence: CC BY-NC-SA 3.0 IGO.